Reverence Mount Kailash 6,724m predominantly towering in the western Tibet adhering to theological importance in Asian four major religious creeds such as Hinduism, Buddhism, Jainism and Bonpo. It is believed that Holy Mount Kailash an object of spiritual pivotal of the universe everything go around on it. According to the Hindu theological dogma described in Sanskrit scriptures, immortal god Shiva resides on this mountain accompanying his divine consort Parvati performs his yogic austerities. It is also believed that the devotees of Shiva those who succeed in this pilgrimage by circumambulating once they would attain releasing power from clutches such as of all kinds of illusory conceptions and unawareness. Emanating from the gradient of the Holy Mount Kailash four brooks that begin flowing east from the mouse of horse, west from the mouth of Elephant, north mouth of Lion and south from the mouth of Peacock. As this reverential sanctum is important for Hindus likewise it constituently imparts on equal value to Buddhists too. Tibetan Buddhists entitled this mountain Kang Rimpoche, meaning 'Precious Jewel of Snow.' Unquestionably, there must be immense of religious mysteries hidden in the Buddhist scriptures as significances. Out of these few are revelatory for the devotees is if any one circumambulates Holy Mount Kailash once, will be blotted completely out of one's sin of whole lifespan whereas, accomplishes108 times then attain salvation since Hindus, Buddhists believe in transmigration. A circumambulation normally completes in 3 days walking off a periphery of 53 km. unsurprisingly, locals complete even one single day by all means it is an effect of their indefatigable physical strength acquiring of acclimatization. Another scenic excitement of this destination is Sacred Lake Manasovar a depth of 70m. with lotus having eight petals, locates at an altitude of 4,560m spreading out with a circumference of 90 km is a cardinal target of this pilgrimage. As Holy Mount Kaliash immensely sustains religious purports as does the Lake Mansarovar. For Hindus Manasarovar is the 'Manas' the soul of Brahama bathing place of god Shiva and goddess Parvati. if any devotee who takes a bath by dipping into its emerald water believed to be a symbolically a deliverance to (Baikuntha) abode of Bramha, and drinks water from this Lake cleanses from the entire sins of 100 births. In the similar manner for Buddhists applies the same one single time of bath washes out the sins of one birth and drinks water from this lake wipes out 100 birth's iniquities. Traditionally, Lake Mansarovar is a glorious personification of human Consciousness and Enlightenment as well as the mother of four prominent rivers namely Bramhaputra, Ganga, Satlej and Indus which flow supplying waters in the land of Asia having been various means of usages. Likewise, for the sects of Bon enthusiasts of Tibet's pre-Buddhist follower of shamanistic religion also sanctified Holy Mount Kailash as a sacrosanct object of worship since it still was a spiritual vicinity of Zhang Zhung. For the founder of this Bon religion Tonbo Shenrab, a Persian empire who migrated to the western Tibet who believed to be alighted from heaven. This also a famous site of commemorating history of a battle between saint Milarepa and the Bon shaman Naro Bon-Chung in 12th century. Unlike Buddhists and Hindus Bonpo believers make their circumference around the Holy Mount Kailash in anti-clock wise direction. Similarly, for Jain believers also a great place of revering value. They named it Mount Astapada in place of Holy Mount Kilash believing that it is a place revered as Rishaba (twenty-four Tirthankaras) meaning attaining salvation. Hence, Across The Himalayas Treks Pvt. Ltd. is always at your disposal in organizing a tour to those enthusiasts who have been dreaming to be in this unique world as this company is dedicated in offering its reliable service with a crack team of crew since last two decades. Out of several routes this company has customized very common itinerary which is tabulated as below. Welcome guests from the arrival lounge and transfer to hotel. Time left at guest's disposal and a briefing in the evening followed by a cordial dinner. Having breakfast a conducted sightseeing tour embarks on to Pashupatinath the holiest place for Hindu devotees and Boudanath Most important place for Buddhists. Lunch break at guests' options at noon after lunch continue tour to Patan and Swayambhunath then back to hotel. The evening will be a tour preparing time by extracting belongings to be carried. We often emphasize on light travelling. Before picking up early in the morning from the hotel guests must have their breakfast. Entire crew will be taking care of the guests to set out journey outing valley only short stop at Dhulikhel for fuel. Before reaching border Kodari road will go two different river banks called Sunkoshi and Bhotekoshi and eventually after 4/5 hours of driving we stop at Kodari the border Nepal and Tibet. This will be the lunch spot and as our liaison will process abrupt immigration formalities then tour will proceed entering Tibet after Crossing Friendship Bridge and few hours driving we will be at Nyalam 3,750m for first night halt. This day is spared for acclimatization which is compulsory for this tour. All guests will be acclimatizing with the elevation of 3,750m to fit for the rest journey. Our Sherpa guide will decide on the physical condition of the guest whether one should continue further or not. No complimentary for those clients who seemed doubtfully unfit for further proceeding. Tour continues progressively climbing up with a height of 5,124m locally called La Lulung shortly descends to western Tibet. Despite difficulty in driving a mighty view of Shisha Pangma 8012m is spectacular only if weather unclouded and extra attraction on the route the Bhramaputra River one of the major rivers origin from Mansarovar Lake. A bit wearing out due to a continual drive reaching until next destination to modern city Saga. Road crosses through wondrous valleys, several clean watered rills, amazing pasturages for yaks and sheep. Rare and occasional approach of some nomads, traders and locals is not uncommon we proceed tour viewing landscapes, snowy mountain peaks, sand dunes and no doubt typical geographical diversities in Tibetan lands our stop will be at Paryang another promising town of Tibet. You can view an astounding peak of Mount Gurula Mandhata 7,728m. as well as Trugo Monastery and Chiu Monastery are the main attractions of the route. In agreeing with the cosmological evidences described on Hinduism and Buddhism the holiest Manasarovar Lake dominates all among various lakes discovered in the western region of Tibet. Also as described above on the 4 rivers Brahmaputra, Sutlej, Ganga and Indus you can observe the same. Today will be of flexible day depending on the exclusive program if any worshipping activities our crew will always be favouring to meet the guests' requirements. Remember that this is the day of starting circumambulation of the Holy Mount Kailash. After the ritual activities any optional tour to Tirthapuri in a distant of 140km from Darchen also feasible. But night halt will be at Darchen means should drive back from Tirthpuri. 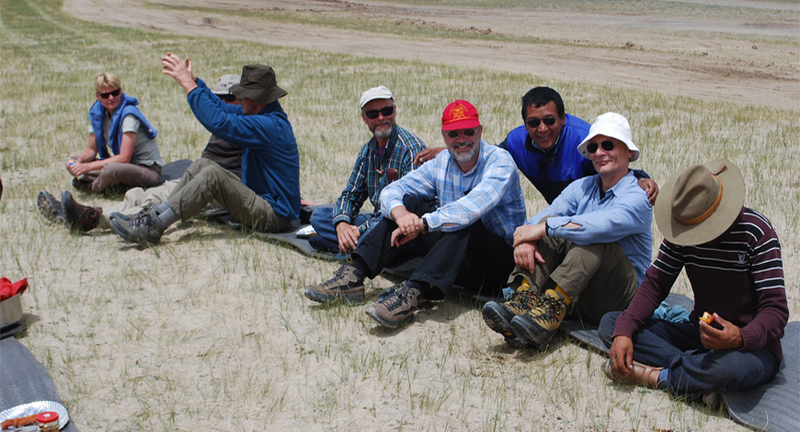 Free day at Darchen on exploring with a valley of wonders also known as valley of several gods. Assuming it another acclimatizing day to ensure for circumambulating to Mount Kailash. There will be another option in doing inner circumambulation accessing to Ausaparvat and Nandi and hiking up to Saptarishi Caves would be a real acclimatization for further adventure. If again our Sherpa guide doubts on indefatigability of the guest no alternatives left for those clients except waiting at Darchen until the arrival of rest members. After a short drive from Darchen about 4km ending at Tarpuche from where the hiking starts as an encirclement of Holy Mount Kailash. This is the first day of hiking and an opportunity of to enjoying the stupas (chortens) and sky burial site of the 84 Mahasiddas. Besides this several rivulets flowing forcibly producing white droplets petering out beautiful cascades, a stunning view of Holy Mount Kailsha itself, on the route Chukku Monastery and ultimately day ends at Dirapuk Monastery. This is the first night camping spot of the holy circumambulation. The hardest day of the pilgrimage is also the holiest. We will cross a rocky expanse dotted with stone cairns draped with The clothes left as offerings by pilgrims who have come before us. After visiting Gaurikunda, one of the holiest sites on the trek, further hiking brings us to the ascent up to Dolma-La pass (5630m). After a nice break at the top of the pass we will head down the steep trail to our eventual campsite at Zutulpuk monastery (4790m), site of the cave of miracles where Milarepa meditated. Ending day of the circumambulation that will last approximately three-hour walk brings back to Darchen where the vehicles are awaiting to transfer to the camping place in the bank of Lake Mansarovar called Hor Chyu. Drive back retracing the same route. Group will be dropping at Friendship Bridge Nepal/China border and handed over to the Nepalese crew continue driving back to Katmandu and drop at hotel. Options left at the clients' disposal either mountain flight or Manakamana or Muktinath pilgrimage tour helicopter chartered basis. This package will be absolutely exclusive with an additional cost.